They're a common sight in the front windows of many different places, from the real estate agents' office to the local bookstore. 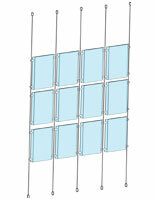 A window display kit with nylon covered cables provides the necessary support for eye catching signage. 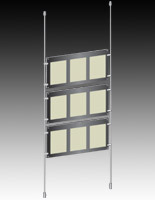 It's a combination of factors that go into these innovative displays, giving you an beautiful, contemporary display for a truly reasonable price. 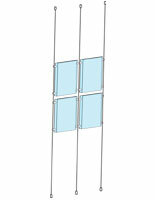 This window display kit comes complete with all of the tools and hardware you need. 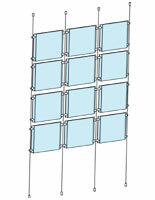 All you have to do is provide the graphics you'd like to put on display. 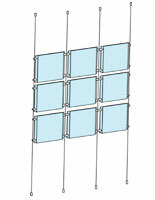 The window display kit, such as a hanging acrylic frame, that is in this category is engineered primarily for letter sized papers and posters. If you require frequent signage changes (like a restaurant with daily menu specials or real estate agents who need to showcase the newest properties on the market) you can easily print out the signs on your own home or office printer. 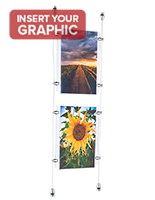 A cable poster holder, window display kit gives you a showcase that puts your promotional images front and center. 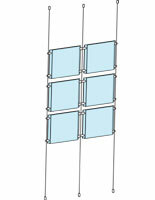 What other outstanding features do these suspension systems have? 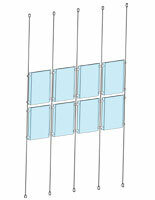 Our window display kit for professional use offers superior hardware, longstanding acrylic frames, and a whole lot of versatility, to name just a few. With all of those good qualities, why hesitate? 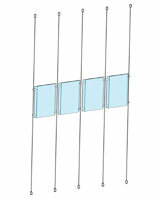 What hardware and supplies come with each cable suspension system? 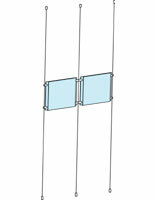 One of the most notable pieces that come in these kits is the poster holder. 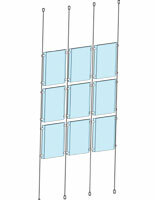 This lightweight frame is made from clear acrylic, which makes hanging the showcase from the chains an easy task. 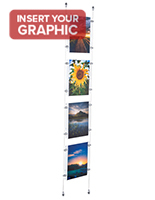 The panels are precision laser cut, and feature a top loading fold over design that makes updating pictures and other promotional images frequently truly easy. 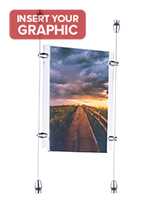 By being crafted from clear, see-through acrylic, you're able to utilize these frames as a dual sided display, doubling the impact and allowing you to advertise in numerous directions with one piece of equipment. 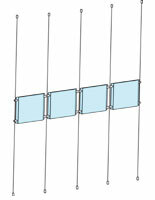 The frames come in multiple orientations in this category. 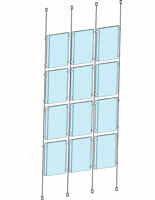 Choose from: 8.5" wide by 11" high, 11" wide by 8.5" high, a dual panel 8.5" wide by 11" high (total measurement: 19.5" wide by 11" high), and a dual panel 11" wide by 8.5" high (total measurement: 24" wide by 8.5" high). 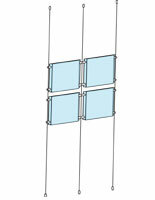 All of the necessary stainless steel hardware for mounting your display systems is included with purchase. 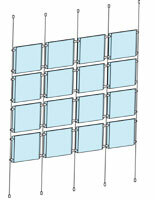 You'll receive panel grippers made out of aluminum with a satin silver anodized finish. 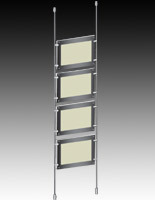 The finish and the curving design add to the contemporary appearance of the hardware. 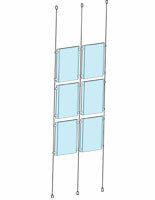 The floor and ceiling mounts have the same appearance, and come with mounting screws and plastic anchors for easy installation. 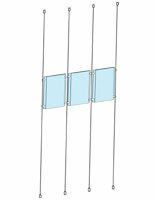 Stainless steel cables for hanging your frames are included as well. 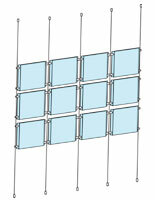 The cables come in 16ft long coils, with enough to support every acrylic frame in your matrix. 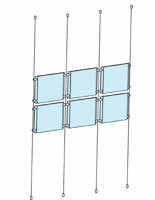 The wires are also coated in nylon for a smooth appearance and to protect against fraying. 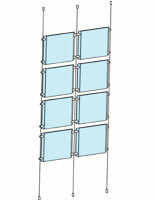 Why should you invest in a window poster hanging system? They're incredibly versatile. 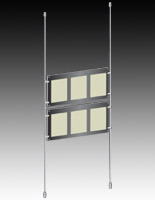 Aside from a wide variety of matrices that can support as few panels as one (1) and as many as eighteen (18), there are extra frames and accessories available for purchase on our website that can be added to the system to create a truly customized showcase for you. 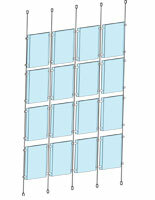 Window showcases are a proven way to increase your exposure with passersby and other potential customers. 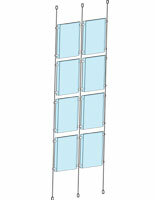 With an irresistible front display, you'll be able to draw in new and returning patrons as well as increase the traffic flow inside your store, leading to an increase in sales. 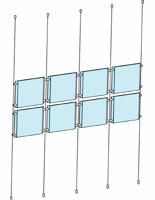 Hanging grids are also great space savers and can advertise even in small spaces! The cables, floor, and ceiling mounts take up a minimal amount of floor space for supporting your system, leaving you with more space for merchandise or for your customers to maneuver about in. 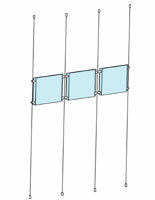 The wire suspension systems can also be used as a way to create a wall divider in a store (to separate the men's clothing from the women's clothing, or to cordon off a separate seating area in the office of real estate agents, and more). 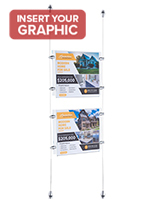 These poster hanging displays are also quite simple to install and use. 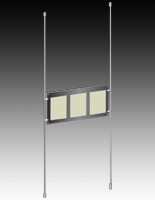 The acrylic frames can be installed almost as soon as you take them out of the packaging, and changing out images and prints is quick and easy thanks to a top slot designed into the frames. Finally, the price. 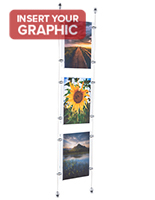 While these displays aren't the cheapest of the cheap, they are quite reasonable, giving you the opportunity to invest in a modern, beautiful style of exhibiting pictures and advertisements without breaking the bank. 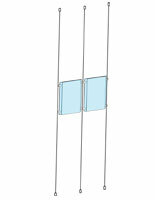 The places where these suspension sets can be found are various! 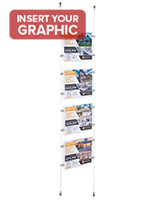 As you know, a window sign kit is very popular with retail stores and businesses, providing a great way for employees to inform customers both inside and outside of the store about upcoming sales, newly arrived products, and other promotions. Restaurants and coffeehouses can use a ceiling hung sign to advertise daily menu specials, a new addition to the drinks menu, or even upcoming bands and other events that will be happening there. 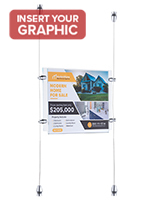 These systems can often be found as a window advertising sign in real estate agents' associations, highlighting for potential owners what new properties have just hit the market. 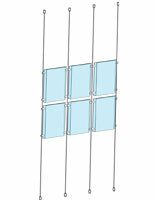 Art galleries can take advantage of these frames as a unique and modern method of showcasing print art and graphics so that they'll truly stand out from the rest. Want to keep customers entertained and aware while queuing up or sitting in a waiting area? 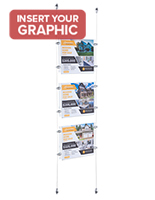 These ceiling hung poster kits are a great way to create a display that's both informative and visually appealing.